If you are tasked with cleaning up a sports website, there are 6 key areas that will give your sports website a fresh new look with the minimum effort and time involved. We have compiled these sports website design resources into a 1-page Sports Website Cleanup Checklist which you can download here. Your website is the front door to your organization and should be warm, friendly and welcoming. It's often not necessary to make a complete service provider change in order to get the new look you want. 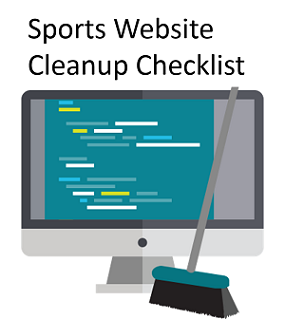 Download our Sports Website Cleanup Checklist and start making your changes today! If you manage a youth sports website, one question you may have is how to make your youth sports website rank higher in Google. You are not alone! The process of improving a sports website ranking is called SEO, or search engine optimization. SEO is most commonly associated with business and eCommerce websites, however youth sports organization can benefit from improved website ranking by following the following SEO tips for youth sports webmasters. Is your sports website optimized for mobile? Better yet, is it responsive? Given the growth of the mobile web, responsive web design is a best practice that helps you provide users with an optimal experience, regardless of whether they are browsing your site on a smartphone, tablet, or desktop. As a youth sports leaders, whether coach or association director, social media your best aid communication and promotional aid. Social media is how busy people now stay connected and up-to-date. Social media can help manage your team, recruiting players, keep parents up-to-date, share your success, and keep player and parents alike, motivated and engaged. Each social media tool has its unique position and should be used like layers of a cake when baking up your overall communications plan. Here are tips to make your use of social media in coaching more productive.